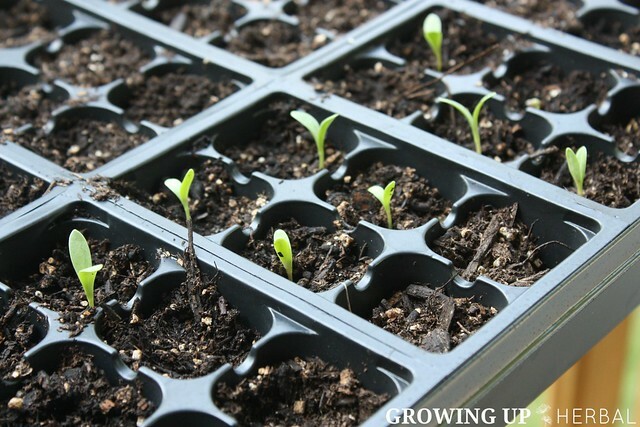 Welcome to the bonus lesson in the June Herb Challenge here on GrowingUpHerbal.com. I had originally planned this as the first weeks challenge, but I could not find calendula seeds or plants ANYWHERE locally… at least not the medicinal variety I talk about below. Finally I found some to order online and because calendula is such a great herb, I wanted to include this lesson in the challenge as a bonus because I honestly think it’s a wise thing to grow your own herbs if you can. Plus, calendula is an easy one to start with! In this bonus lesson, I wanna talk to you a bit about the basics of the herb Calendula… specifically its physical characteristics and how to grow and harvest it yourself. We’ll briefly talk about some of the most commonly know facts about this vast herb and then we’ll move forward into our project. Plant Family: Asteraceae – many flowers, herbs, and even vegetables are in this family. Learn more here. Description: Calendula is flowering annual that grows between 12-18 inches tall. It has bright yellow or orange flowers that are around 1 1/2 inches in diameter. [A] The petals overlap consistently in rows which are several layers thick, each encircling the center disk of the flower. [B] It has a long, slightly fuzzy stem, offset, long (around 6 inches), soft, pale green leaves [C], and a long taproot. Calendula is one of those herbs that seems to be used for everything. Below is a quote from an HerbMentor.com article written by Irene Wolansky. Over the last 4 weeks, you’ve been introduced and gotten to know this herb very well I hope. We’ve discussed many of the actions mentioned in the above quote, and the goal is to have those actions and the plants energetics stick with you in your mind so that you’ll feel confident enough in your knowledge of this plant to use it when you need to. Now onto our bonus project! Our project for this week is to grow some calendula plants! Now you may be wondering why I’m suggesting this, and here’s why. Seeing as how calendula has so many uses, it’s one of those herbs that you will always want to have on hand. Granted that you can find and buy it online, but what happens when you get low on your supply and don’t have time to order more? What happens if you can’t even get it online for some reason? How easy is it to simply go outside and get it right in your front yard? It’s super easy, that’s what. Below I’m going to share some cultivation, harvesting, and preserving information with you about calendula. Be sure to read over it. Next, I’ll be showing you how to get your seeds and plants going quickly. Cultivation: Calendula is a hardy, easy-to-grow plant that grows well in most soils. It prefers full sun to partial shade. It can be directly sown after the last frost has passed. It will germinate in 7-10 days and begin to bear flowers after 2 months. Seedlings need to be thinned 10-12 inches so the plant has room to grow. 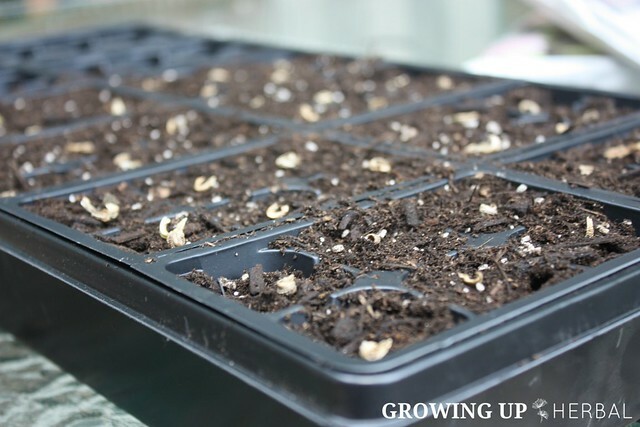 You can also sow seeds again in the summer months to ensure a second fall harvest. Plants will continue to bear flowers until fall frosts come. Seeds ripen during August and September. They can be gathered and saved for the following spring or allowed to scatter on their own, overwinter, and self-start when the weather warms up the following year. Water plants 1-2 times a week, especially during the hotter months. These plants attract bugs! If you want to keep bugs away from vegetable plants, inter-plant vegetable plants with calendula so the bugs are attracted to the calendula flowers first. If you want the bugs to leave your calendula plants alone, harvest the flowers frequently. Harvest flowers during the hottest time of the day. This ensures the resins are highest within the plant and the water is lowest. Flowers need to be immediately used fresh, frozen, or dried to prevent spoilage. At the end of the growing season (6-8 weeks after planting), leave some flowers if you want to save seed for the following year. Harvesting: When harvesting calendula flowers, simply pinch or cut the flower off right under the sepal of the flower. [D] The more flowers you harvest, the more will bloom. Preserving: To dry flowers, simply spread flowers out on a flat surface and keep them there for 10 days at 90 degrees. You can use a dehydrator as well if you prefer. To tell if a flower is completely dry, break it apart. It should crunch like a dry cracker, especially at the sepal area. If it doesn’t crunch, it’s not fully dry and will mold during storage, ruining your whole batch. To freeze flowers, simply place them in a plastic freezer storage bag, expel as much air as possible, and place in the freezer. You can also lay flowers out individually on a cookie sheet to freeze before putting them in a bag together. This will prevent them from sticking to each other. Now, just for good measure… check out the seasons of calendula in the photo below! Since these supplies were not listed in the Herb Challenge Intro post, you can choose now if you wanna take part in this project. It does NOT count towards the giveaway winner which will be announced this coming Monday. If you do want to take part in this project, you’ll need some calendula seeds. You can purchase them here from Mountain Rose Herbs or here on Amazon. Once you get your seeds, come back to this project and do it. Don’t forget! Below I’ll show you what to do! Let’s go! 1. Take your pot or basket and fill it full of planting soil. If you’re planting directly in a flower bed, be sure to till the bed well and add in some potting soil or compost in order to nourish and loosen the soil more. 2. 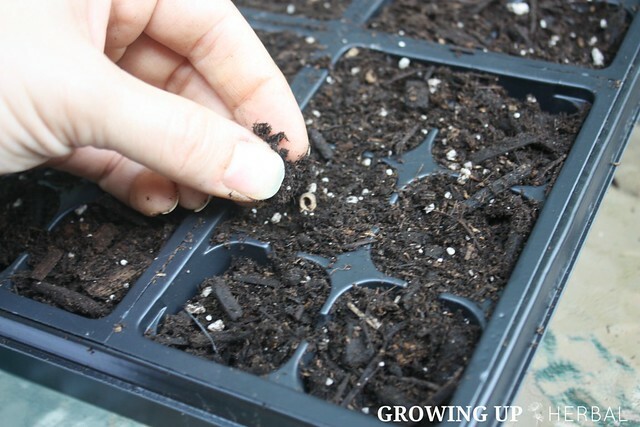 Sprinkle your calendula seeds over the soil, and cover with 1/4 inch of extra soil. Pat down gently and water. 3. If using a pot or basket, place it in direct sunlight, and don’t forget to lightly water it every day or so until your seeds germinate. After that, lightly mist the small plants until the first set of true leaves appear. At that point, thin plants so that they are 10-12 inches apart, and you can water 1-2 times a week. The following recipe is a great recipe to make and use for fungal infections on the skin, specifically for yeast rashes on babies bottoms or for athlete’s foot. Combine powders in a glass bowl. Add essential oil drops to scent and blend oils into powder well. When well blended, store in a bottle with a shaker top. Apply 3-4 times a day. Okay, so another mini-quiz to see what you remember! Good luck! Is calendula easy or hard to grow? Does it attract or repel bugs? What part of calendula do you harvest? Root, leaves, or flowers? What will happen if calendula isn’t completely dried before storing? What’s another way to store calendula besides drying. So that’s it for this bonus lesson. If you’re inspired to grow your own calendula then “go you”! What a great way to challenge yourself even further and ensure you always have this great plant right at your fingertips! Be sure to come back this Wednesday for the last post in the calendula herb challenge!